Stefan Kartman currently serves as Professor of Cello and Chamber Music at the University of Wisconsin - Milwaukee where he teaches cello and chairs the string area. Dr. Kartman also serves on the faculty of The String Academy of Wisconsin, the state’s premier pre-college string training program. As a recording artist, he has recorded the Complete Works of Beethoven for Cello and Piano, publishing an edition of the Beethoven complete works as well. As a pedaogue, he is currently publishing a teaching method entitled An Artist’s Guide to Cello Technique. 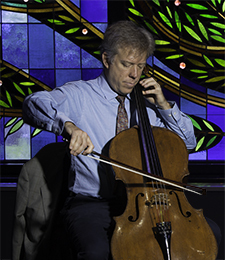 In addition to solo performance, Dr. Kartman has performed to critical acclaim as cellist of Trio Antigo, the Kneisel Trio and the Florestan Duo, giving performances and masterclasses in conservatories of music and institutions of higher education worldwide including the Cleveland Institute of Music, the China Conservatory of Music and the Xiamen Conservatory of Music, and the D’Albaco Conservatory of Music, among many others. An avid chamber music enthusiast, Dr. Kartman has served on the faculties of the Vianden Chamber Music Festival in Luxembourgh, the Madeline Island Chamber Music Camp, the Garth Newel Chamber Music Festival, the Alfred University Summer Chamber Music Institute, the MidAmerica Chamber Music Festival, the Green Mountain Chamber Music Festival, and was artistic director of the Milwaukee Chamber Music Festival. During his formal training as a chamber musician, he studied with members of the Guarneri and Juilliard String Quartets and the Beaux Arts Trio. Dr. Kartman has been teaching assistant to Harvey Shapiro and Zara Nelsova of the Juilliard School and proudly acknowledges the pedagogical heritage of his teachers Shapiro, Nelsova, Bernard Greenhouse.